Robert J. Brown (“Rob”) graduated from Lincolnton High School in 1986, where along with his academic achievements he played football and was a member of the track team as a sprinter and a pole vaulter. Prior to his graduation from LHS, Rob joined the N.C. Army National Guard as a 13- Bravo and served with the 113th Field Artillery. He attended Basic Training and Advanced Training at Ft. Sill Oklahoma, and was promoted to Platoon Guide during Basic Training. During his military service, Rob successfully completed Basic Non-Commissioned Officer Course (BNOC) and Advanced Non-Commissioned Officers Course (ANOC), and eventually served as the PT-NCO for his unit. He received an Honorable Discharge in 1991 after attaining the rank of Sergeant (E-5). In the Fall of 1986 Rob attended Appalachian State University and was an active member of Lambda Chi Alpha fraternity where he served in leadership roles as the High Kappa (Fraternity Educator) and the High Alpha (President). During his last semester at ASU, Rob was selected as the Student Legal Services intern and worked directly with a licensed attorney in handling minor legal matters for students. After graduation from ASU, Rob attended Regent University School of Law in Virginia Beach, Virginia. During his last two years in law school, he worked for Kellam, Pickrell, Cox & Tayloe in their Norfolk and Virginia Beach offices primarily performing real property title examinations. 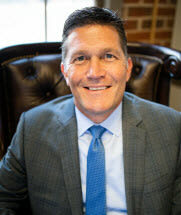 Rob graduated from Regent and returned to Lincoln County in 1994 and worked with David M. Black, Attorney at Law, until he opened his own practice in 2000. In early 2012, Rob and his staff joined The Jonas Law Firm, PLLC, to manage its Denver office. Rob’s practice primarily concentrates on commercial and residential real estate acquisition and development, and land use planning and zoning. Rob married his high school sweetheart, Kara Gates Brown, who is the New Business Manager for the Lincoln Economic Development Association, and they have two beautiful daughters. Rob has served in many civic organizations and on many local Boards including: Lincoln County Family YMCA (several terms as Chair); Sally’s YMCA (several terms as Chair); Communities in Schools (Chair); Lincolnton Rotary Club; Lincolnton-Lincoln County Chamber of Commerce; and American Red Cross. Rob currently serves as President of the Lincoln Charter School Board. Rob and his family are active members of First Baptist Church in Lincolnton where he currently serves as Moderator, Chairman of the Safety & Security Committee and as a Deacon. He has served as Chairman of the Deacons, Chairman of the Budget & Finance Committee, Chairman of the Policy Committee, Chairman of the Youth Committee and as a Youth Sunday School teacher. Rob enjoys spending time on Lake Norman, and attending Appalachian and Carolina Panther football games with family and friends.